Onam is one of the greatest festivals of Kerala. 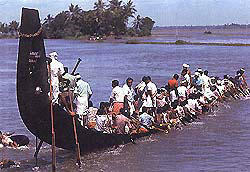 It is the festival, which the keralites celebrates unitedly without the differecnce of caste and religion. Onam is related with King Mahabali who was ruling kerala in a time. He was an Asura king but was very nice and trueful. During his ruling time it is said that people don't even lock their house in the night because , there was no thieves,no corruption,no betrayal. And all people lived unitedly, without the difference of rich and poor. All where facing a good time. Like wise the king was so good that he will give anything to anyone. At that time the Hindu lord Mahavishnu decided to test King Mahabali. He came to earth as vamana a poor dwarf, and went straight to King Mahabali. He told the King that he has nothing and he want three feet of land to live. The king hearing this laughed and told Vamana to take three feet of land from where ever he wishes. Suddenly Vamana began to grow and he covered the whole earth by one foot and covered the sky with other foot. And asked Mahabali where is the space for the third foot. By seeing all these, the king understood that Vamana is not an ordinary person, and Vamana has come to test him so the king without hesitating showed his head to keep the third foot. Vamana kept his third foot on the King's head and the King was pushed down under the earth (pathala). The king after going to Pathala asked Vamana his true identity, Suddenly Vamana vanished and Lord Mahavishnu stood before Mahabali. Mahabali was overjoyed by seeing this. The lord told Mahabali that he wanted to test Mahabali and he has won in that. The lord also asked Mahabali to ask any boon for himself. Mahabali told the lord that, he loved his people very much so he wanted permission to visit Kerala once in a year. And the lord gave permission for that. It is that day ie. the day Mahabali visits kerala is celebrated as Onam. Onam is a celebration of Ten days. It comes in the month of "Chingam" according to Malayalam calender. People put flower mats in front of their houses, to welcome the King. There will be competition for the laying of flower mats; Keralites all over the world will be celebrating this ten days will pomp and gaiety. They will wear new dresses, will be visiting almost all temples which they can, they will be performing lot of dances like Thiruvathira kali Thumbi Tullal etc. to name a few and the most important thing is the grant lunch they will be having on the Thiuruvonam day. Which is also called the Fourth Onam. Whatever may happen they will not miss the Grant lunch. There is a saying in Malayalam that "Kanam Vittu Onam Unnanam" which means "We should have the Thiruonam lunch even if we have to sell all our properties". They give that much importance to the lunch on the Thiruonam day.